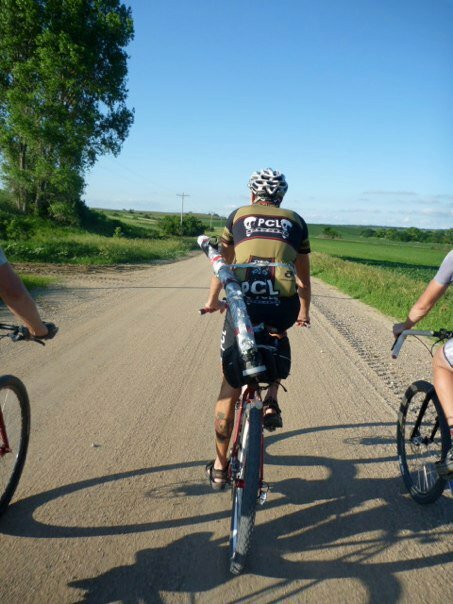 It was the summer of 2011, and I was diving head-first into long distance gravel riding and racing. I’d done a century ride or two, and ventured out with a really great group of people for the Ponca Ride, an annual 155-mile trek straight north from Lincoln to Ponca State Park. It’s the kind of ride you could point out on a globe — just a big long line up to the South Dakota border. We gathered at D Street at 3:30 AM in a wild thunderstorm. Our 4 AM departure wasn’t going to be so feasible. Several people popped open beers to kill the time while watching the radar, getting an early start on celebrating the Wizard Staffs Across the World day. Finally, around 4:30 or even 5 AM, the worst of the storms had passed, leaving just the steady rain of a June thunderstorm in Nebraska. We rolled through downtown Lincoln. We headed north on the highway, the gravel roads too soaked from the rain to be rideable. We stopped at the gas station in Valpo, shivering and soaked, shaking while holding cups of coffee and cocoa. Fifty miles in, we stopped for breakfast at the Corner Cafe in North Bend, eating two breakfasts each. The mood after the Corner Cafe was electric. Our group of 17 or so rolled out of town, further north, onto dry gravel. The rollers were relentless, but spirits were high. I was feeling great. I was doing an amazing long group ride with so many great people. I’d been warned that the last 50 miles of the ride were harder than the first hundred, but I was feeling great. The miles ticked away. But around mile 100, things started to fall apart a bit. The closer we got to Pender, 110 miles in, the worse it got. I couldn’t take a deep breath no matter how hard I tried. It just hurt, my lungs just searing as I took tiny little breaths. I wasn’t even going 10 mph. I crawled into Pender, and curled up on the bench outside the Subway. Everyone else was eating sandwiches and ice cream, but I could barely open my eyes. My friend Ashlee had offered to pick me up if I needed to bail. I couldn’t imagine getting back on the bike. And then CVO came up to me with a sandwich. He sat down. And he told me something that’s stuck with me in every single bike race or ride I’ve done ever since. He and Wills would roll slow, he promised. “I won’t lie, it’s a hard 40 miles that’s left. But you’ll make it.” I ate some food. I started feeling better. And I got back on the bike. And CVO, and Wills, and Fob, and Rhino Albeez and Malcolm T, and Scott Bigelow, they all helped me get there. There were many times where CVO did little things to make me feel like I belonged in Lincoln’s bike world. Times where he quietly lent a hand, helping Sheclismo in so many ways over the years. Helping Star City CX get off the ground. But it’s this memory that sticks with me the strongest right now. Of sitting on his wheel, struggling to make it up each successive hill, watching his wizard staff with belt attachment bounce along the road. Cheers, Christopher Van Ooyen. The constellation of people that make Lincoln good lost a bright force today.